Home > 2000 > April 00 > Authors > Lynnford Beachy > Newsletters > Questions and Answers > Son of God > Son of God Q&A > Truth About God > Truth About God Q&A > Question: How do you explain that Jesus was not a created being, yet came after the Father and is God’s literal Son? This should be clear enough. The Scriptures testify that God created, through Christ, everything that was ever created and without Christ was not anything created that was created. This proves conclusively that Christ was not created, for it would have been impossible for Christ to create Himself. The Bible speaks of Christ as “the Son of God,” “the Son of the Father,” “beloved Son,” “dear Son,” “the Son of the living God,” “the only begotten Son of God,” “Son of God most high,” “Son of the Highest,” “Son of the Blessed,” “Son of the most high God,” etc. I have a son, yet I would never claim that I created my son. This would not be accurate. There is a vast difference between something I create and my son. As an example, I know it is impossible for humans to create life. However let us suppose I had the power to create life. Suppose I could create a cricket. I could put thousands of hours into the finest details of this small insect. The cricket would certainly be valuable to me. I could say I created that cricket. Yet I would value that cricket far less than my son. If I were asked to give up that cricket for the benefit of someone else, it would not be too difficult for me to part with it. That would be a sacrifice, but it would fall very short of equaling the sacrifice that would have to be made if I were asked to give up my own son for the benefit of someone else. If I were to give up my own son that would be a great sacrifice on my part—much more than giving up a created insect. Certainly you can see the vast difference in giving up something I created, and giving up my own son. I would like to provide an abundance of Bible evidence showing that Christ really is the Son of God; not an angel, not a created being, but “the only begotten Son” “of the most high God.” (John 3:16; Mark 5:7) Please take the time to examine the following Scripture evidence. “God, who at sundry times and in divers manners spake in time past unto the fathers by the prophets, Hath in these last days spoken unto us by His Son, whom He hath appointed heir of all things, by whom also He made the worlds; Who being the brightness of His glory, and the express image [“a precise reproduction in every respect”—Thayer’s Greek Lexicon] of His person, and upholding all things by the word of His power, when He had by Himself purged our sins, sat down on the right hand of the Majesty on high; Being made so much better than the angels, as He hath by inheritance obtained a more excellent name than they.” (Hebrews 1:1-4). The Son of God was appointed by His Father to be heir (“one who receives his allotted possession by right of sonship”—Thayer’s Greek Lexicon) of all things. And He has, by inheritance, obtained an excellent name. According to the Scriptures, Jesus Christ is the literal Son of God. “For unto which of the angels said He at any time, Thou art my Son, this day have I begotten thee? And again, I will be to Him a Father, and He shall be to me a Son? And again, when He bringeth in the firstbegotten into the world, He saith, And let all the angels of God worship Him… But unto the Son He saith, Thy throne, O God [The Father refers to His Son as God], is for ever and ever: a sceptre of righteousness is the sceptre of thy kingdom. Thou hast loved righteousness, and hated iniquity; therefore God, even thy God [The Father, referring to Himself as the God of His Son], hath anointed thee with the oil of gladness above thy fellows… But to which of the angels said He at any time, Sit on my right hand, until I make thine enemies thy footstool?” (Hebrews 1:5-13). The Greek word that was translated firstborn in this verse means, “born before all creation.” (Wigram’s Greek Lexicon) “Christ is called, firstborn of all creation,who came into being through God prior to the entire universe of created things.” (Thayer’s Greek Lexicon). 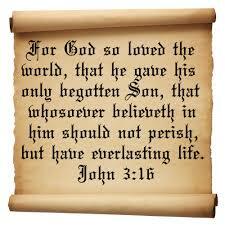 Jesus Christ is in reality the Son of God who was begotten by His Father before anything was ever created. “But thou, Bethlehem Ephratah, though thou be little among the thousands of Judah, yet out of thee shall He come forth unto me that is to be ruler in Israel; whose goings forth [origin] have been from of old, from everlasting [Hebrew: the days of eternity].” (Micah 5:2). “Whose origin is from of old, from ancient days.”(Revised Standard Version). This verse is talking about the Son of God, whose origin (beginning) was long before the beginning of this world; and time as we know it. The terms Father and Son, by definition, indicate the existence of the one before the other. This was the understanding of the Israelites. “Who hath ascended up into heaven, or descended? who hath gathered the wind in His fists? who hath bound the waters in a garment? who hath established all the ends of the earth? what is His name, and what is His son’s name, if thou canst tell?” (Proverbs 30:4). This is an important issue, for it deals with whether Christ is in reality the Son of God or not. John wrote, “Who is he that overcometh the world, but he that believeth that Jesus is the Son of God?” (1 John 5:5) Jesus said, “For God so loved the world, that he gave his only begotten Son, that whosoever believeth in him should not perish, but have everlasting life.” (John 3:16) It was God the Father who loved us so much that He willingly allowed His only begotten Son to die for us. Please examine the following verses carefully. “In this was manifested the love of God toward us, because that God sent his only begotten Son into the world, that we might live through him.” (1 John 4:9) The greatest manifestation of God’s love is that He allowed His only begotten Son to die for us. “He that spared not his own Son, but delivered him up for us all, how shall he not with him also freely give us all things?” (Romans 8:32) By God yielding up that which was most dear to Him, His only begotten Son, He proved that there was nothing in the entire universe that He would not be willing to give up for us. This is the greatest love that anyone could manifest. It is much harder for a father to allow his own child to die than for him to offer up his own life. It was a struggle for the God of the universe to yield up His only begotten Son.